A very small, faint galaxy — possibly one of the long sought "building blocks" of present-day galaxies — has been discovered by a collaboration between NASA's Hubble Space Telescope and the 10-meter Keck Telescopes at a tremendous distance of 13.4 billion light-years (based on the estimate of 14 billion years as the age of the universe). The discovery was made possible by examining small areas of the sky viewed through massive intervening clusters of galaxies. These act as a powerful gravitational lens, magnifying distant objects and allowing scientists to probe how galaxies assemble at very early times. This has profound implications for our understanding of how and when the first stars and galaxies formed in the universe. A team of American and European scientists conducting a unique, systematic search for very distant objects, among the most distant known, using the Hubble Space Telescope and the Keck Telescopes, and benefiting from the magnifying power of a foreground giant cluster of galaxies, has discovered one of the smallest and most distant galaxies known to date, pushing both telescopes to their limits. Abell 2218 is a rich galaxy cluster composed of thousands of galaxies and a mass equivalent to ten thousand galaxies interspersed throughout the cluster. The cluster is located relatively nearby — at a distance of 2 billion light-years (a redshift of 0.18). Redshift is the stretching of light waves as they travel across expanding space. The longer they travel, the more they are stretched, and the higher the measured redshift. The gravitational field from this huge concentration of matter distorts and magnifies the light from distant galaxies according to Einstein's General Theory of Relativity. Gravitational lenses, the equivalent of nature's magnifying glasses in space, give researchers a unique tool with which to learn more about the detailed physics of the first galaxies in the universe. The recently discovered "baby galaxy" has a redshift of 5.58, corresponding to a distance of about 13.4 billion light-years. The galaxy's light has been magnified more than 30 times by Abell 2218 and split into two "images" by the uneven distribution of matter in the cluster. The international team, led by Richard Ellis from the California Institute of Technology (Caltech) in Pasadena, CA, determined the amount of matter in the object to be astoundingly low for a galaxy — only a few million times the mass of our Sun, or about one hundred thousand times less than the amount of matter in our own Milky Way galaxy. The object is only around 500 light-years across, as compared to the 100,000 light-year diameter of the Milky Way. Many galaxy clusters were investigated before such a clear-cut candidate for a very distant galaxy building block was found. Images taken from the Hubble archive and spectroscopy carried out by one of the ground-based Keck Telescopes revealed that this galaxy is one of the most distant found so far. 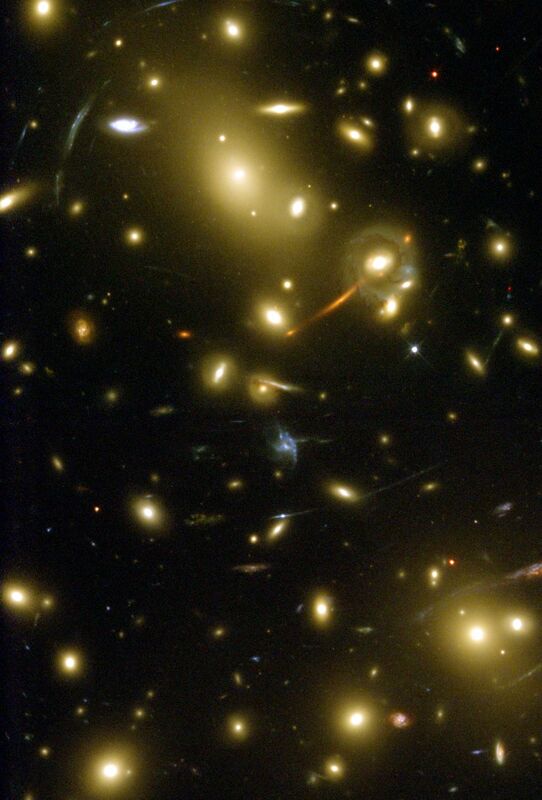 Ellis explains, "Without the benefit of the powerful cosmic lens, the source would not even have been detected in the Hubble Deep Fields, historic deep exposures taken with the Hubble Space Telescope in 1995 and 1998." Jean-Paul Kneib from the Observatoire Midi-Pyrenees, France, an expert in gravitational lensing, describes the excitement of the team: "It took two observing runs with the Keck Telescope before we had gathered enough light from this feeble object to determine its distance and thus confirm the discovery. When we realized what we had found, we literally jumped up and down." Research team member Konrad Kuijken from the Kapteyn Institute, the Netherlands continues, "We are very excited. We are looking at something very small and very young. 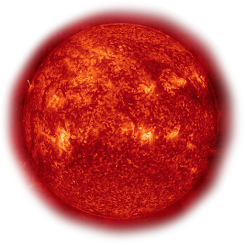 A two million year old, one million solar mass, galaxy-like object consisting of young hot stars is the best fit to the observations. We believe it is one of the galaxy building blocks that join together and make up larger galaxies later in the history of the universe. With this discovery, we may finally be witnessing the circumstances in which this first generation of stars was born." The first galaxies in the universe hold invaluable clues that shed light on the period known as the cosmic "Dark Ages," a period that lasted possibly up to one billion years after the Big Bang and ended when the first generation of stars appeared.